I love frittatas! They are insanely easy to make, healthy, and open to your dietary preferences! On weekends, frittatas are usually my go-to dish because they don’t require a lot of time or attention. My husband and I relish our weekends because we allow ourselves to be a little gluttonous and lounge around in bed until we decide to get up. We think it’s pretty awesome (we currently only have a fur-baby, so we thoroughly enjoy the luxury of sleeping in)! Today, I decided to revamp one of our morning rituals with some of my ento-enthusiasm. While I only have a small-stock of mealworms currently available to harvest, I was too excited not to try using them in something that has become commonplace in our weekend morning tradition: the frittata. Before you get grossed out by the thought of eating mealworms, consider this: 100 grams of mealworms is made up of 23.7 grams of protein, 5.4 grams of fat, 23.1% calcium, 2.2% iron, 4.6% zinc, 340 % potassium, 5.6% niacin, 60.6% magnesium and 0.5 mcg of B12 (see Daniella Martin’s, Edible Insects and Elliot Lang’s, Eating Insects. Eating Insects as Food. for more information)!! Pretty amazing in comparison to other animal products we consume. One of the best things about this is that I just had to walk into another room in our apartment to harvest them–just an added plus of raising your own! I like to prep before I start cooking and I usually start by dicing/chopping everything that requires it and setting those ingredients aside. Fortunately, making a frittata is one of the easiest things you’ll ever do and frittatas look beautiful to boot! If you have guests over, they’re easy to split and you can make a side of breakfast potatoes or include some fresh fruit to top it off–all in 30 minutes or less. Before I begin prepping the veggies, I prep the mealworms. I actually took them from my own stock. I just scooped them out into a small plastic tupperware container I had and put them in the freezer. Fear not, they are cold blooded, so they are essentially lulled to sleep and then die without a thought. I know, it sounds harsh, but I guess I would rather die in my sleep than anything else. After the mealworms are tucked in the freezer, I begin with putting some olive oil in a pan (usually non-stick) and turning the heat on medium. As the pan is heating up, make sure the oil is evenly dispersed around the base and sides of the pan. After the oil has warmed up, toss in the diced onion. While the onion is cooking, beat the eggs until they are fluffy and set them aside. At this time, you can take the mealworms out of the freezer, put them into a colander, rinse them off, and quickly dice them. Then, once the onions are translucent and slightly brown, toss in the diced mealworms, salt, pepper, and garlic powder. Turn up the heat slightly and stir a few times, then add the cherry tomatoes and turn the heat back down. After about a minute, throw in the chopped spinach and toss in the parmesan cheese and fresh thyme. Stir everything so it’s spread evenly throughout the pan and then whisk in the eggs. Cover and turn the heat on low. Keep an eye on the frittata, as it cooks quickly. Once the eggs puff up and there is no remaining liquid on top, it’s ready to serve. Voila! 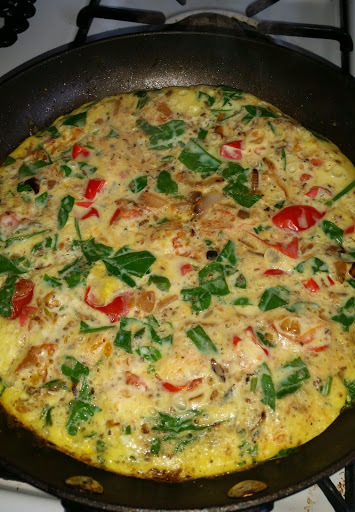 I presented my husband with his frittata and mentioned it was an extra special one, as it had a great source of protein. His face completely changed…he knows me too well. He usually looks forward to our brunches. I told him I put mealworms in the frittata. The hubbs looked afraid, but he took a bite and said, “I don’t even taste the mealworms!” He went on to mention that the frittata really didn’t taste any differently than it normally does and that the mealworms had a nice mushroomy taste. I would have to agree. 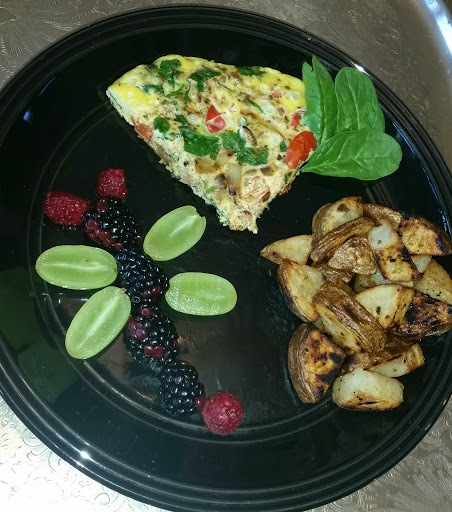 The mealworm frittata was a success! Score! **If you have picky eaters at home, you can always find cute ways to garnish or add flavors that might visually or gustatorially distract your friends and loved ones from the idea that they’re consuming something that has been stigmatized in the Western world for a very long time. My husband and I like to use hot sauce and salsa with our frittatas, and occasionally cream cheese. I assure you, they are absolutely delicious! Enjoy! Next Post Mealies and Waxies and Chirpies! Oh My! Today is World Edible Insect Day! !